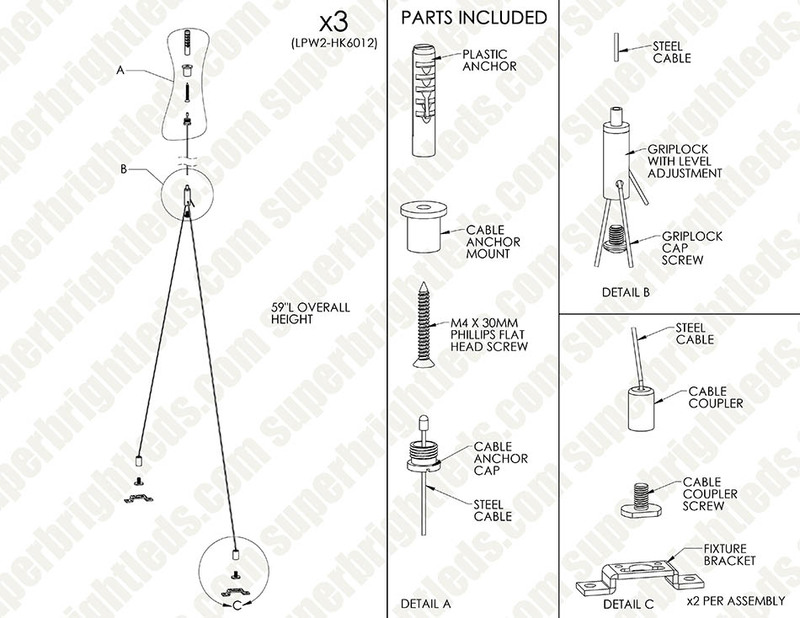 Use this suspension kit to hang your 4' x 2' LED Panel Light Fixture. 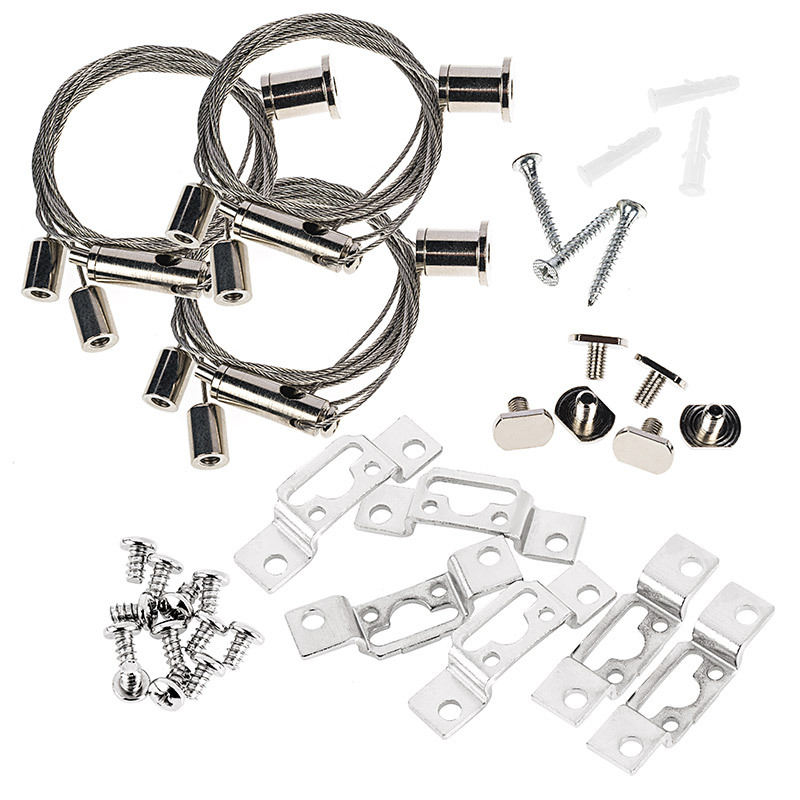 Kit includes 3 stainless steel braided cables and mounting hardware. Cables provide suspension of up to 2-1/2'. Sadly this suspension hardware, although sturdy, causes a warping of my 2' by 4' LED panel. I was meticulous in hanging the panel, but I couldn't get it to remain flat. Also, there was stress on the outer edges of the panel because each of three wires is shared by two brackets and pull on them. This design also means that there is a minimum distance of panel from ceiling of about 14". I eventually gave up and had to build my own mounting grid using wooden slats on the ceiling, cup hooks, and turnbuckles. Now the panel is flat and much closer to the ceiling where I want it. If this suspension kit included 6 individual wires, one for each panel bracket, it probably would have worked and would have allowed a closer-to-ceiling orientation. I am really seconding what the other reviewer said. I did not quite understood what they meant until I hung the lights, and ended up with the wonky result. There is no way to prevent the light panel from twisting in the hung position, so one corner goes up and then the opposite corner will go down. The only way around this *might* be to have a template that mounts all 3 ceiling anchors in an exact line with exact space, but without that, it will just be impossible to get the thing to work properly. Kinda disappointing, really, unless I take the time to custom engineer my own solution just to hang a few lights. It might not even be possible to hang the 2x4 lights without them flexing, since they are so thin. Wire hanging solutions for flat panel lighting will require careful measuring to avoid twisting and uneaven installations. To use these, you will have to have a lot of head room to accommodate the wire system. You will have to be somewhat close in spacing the wires to get them reasonable close to vertical. If you do this, they are easy to adjust for height and side to side. I have one light that has been hanging for several years now and it still is within 1/8 inch of flat and that is from the sag of the frame across the 24-inch width.